Shopping for your wedding dress can be extremely stressful. From knowing your size, to getting it altered, you can spend months trying to find the perfect dress. Here are five simple things you can do to make your wedding dress shopping experience more enjoyable. Always make an appointment at any boutique you are visiting. Make sure you tell the boutique your size, what you are looking for, and how many people you are bringing so you they can prepare for your arrival. There is nothing worse than arriving at a boutique and being turned away. It is very easy to get carried away when buying your wedding dress. When you make your booking at a boutique also tell them your budget so they can pull out appropriate dresses for you. Keep in mind hidden costs like alteration costs, and service charges. You don’t need loads of opinions when picking your perfect dress. Take your mom and your best friend with you because they’ll be honest about how you look, and want you to look and feel your best. 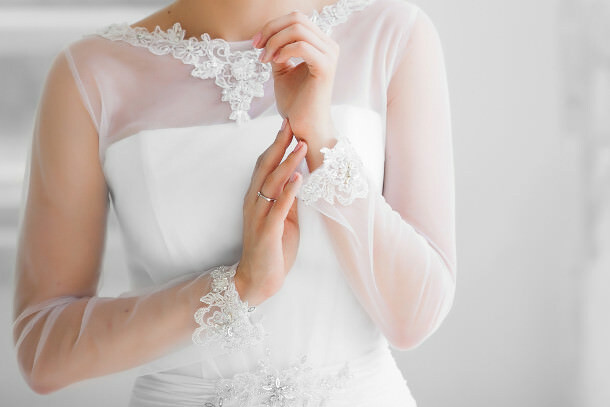 If you've decided to wear Spanx, a push up bra, and a corset on your wedding day, then wear them when looking for and trying on wedding dresses. You’ll see the complete outfit with the correct underwear on, and it will make fitting and alterations much easier. Even if you've not reached your goal weight before you go dress shopping, shop for a dress that will fit you now. You can always have your dress altered to make it smaller, but never to make it bigger.